I AM AND I WILL – WILL YOU? Proud to be part of the Project PINKBLUE Volunteers as we marched on Saturday, February 2nd from Transcorp Hilton through the Federal Secretariat road in Abuja to raise awareness on the menace of cancer in my country. 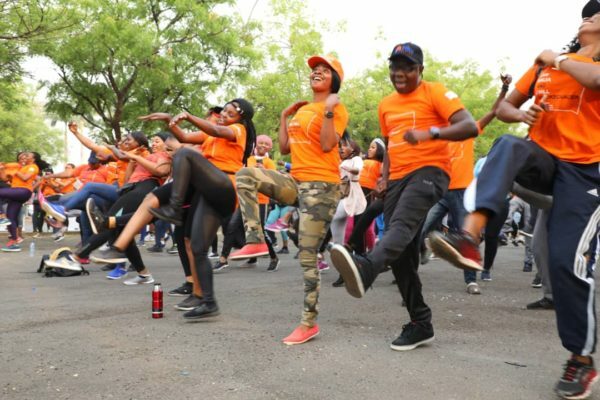 Cyclists were in full gear, skaters, ladies bearing placards, children and babies were part of this event tagged ‘World Cancer Day, Walk, Race, Skate, Cycle and Marathon Against Cancer’. The global theme this year is“I Am And I Will”and Project PINK BLUE adopted a national theme of “Co–Infection and Cancer” with the goal to create awareness on cancer and other co-infections like HIV/AIDS, Hepatitis and otherwise. National Theatre Lagos, lighted Orange and Blue in commemoration of World Cancer Day on Monday, February 4th, 2019. Project PINK BLUE, Health & Psychological Trust Centre, joined the world in commemorating World Cancer Day 2019, a day championed by the Union for International Cancer Control (UICC). 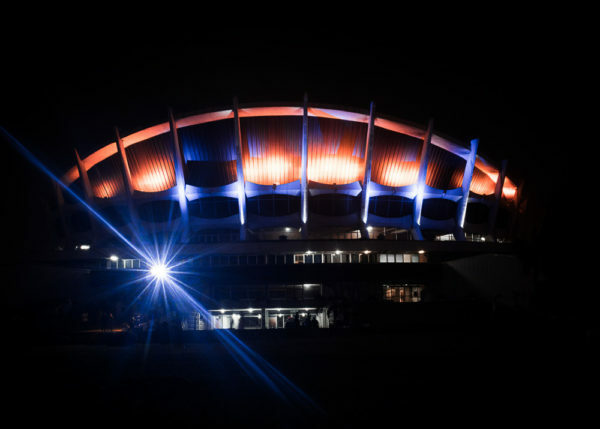 They also illuminated Nigeria’s National Theatre, Lagos orange and blue to commemorate the World Cancer Day 2019 on the early hours of Monday, February 4th, 2019. While, Transcorp Hilton Abuja, a hospitality landmark and one of Nigeria’s biggest hotel was illuminated orange and blue on the early hours of Tuesday, February 5th, 2019. Lighting a landmark is a great initiative to create awareness, advocate for better care and honour people lost to cancer, hence, globally, landmarks are lighted orange and blue……And this is a FIRST! World Cancer Day marked on the on February 4th is one of the largest global initiatives uniting the world to raise awareness of cancer in a positive and inspiring way. It aims to save millions of preventable deaths each year by increasing awareness and improving education about the disease alongside calling on governments and individuals across the world to take action. They used this event to give free prostate, breast and cervical cancer screening to at least 1,000 people. “It is on this premise that I call on the Federal Government, State government and government at all levels to declare a state of emergency on cancer by implementing the National Cancer Control Plan 2018-2022 and state cancer plans, invest in diagnostic capacities, implement measures to reduce stigma and improve public awareness of the signs and symptoms of cancer, implement cost-effective population-based screenings and early detection programmes. Corporate organizations and philanthropist should also support the fight against cancer by choosing cancer programmes as their corporate social responsibilities and adopt cancer patients because we can win the fight against cancer if we all fight together. I also want to call on everyone to take proactive steps to reduce their cancer risks” said Chidebe. It was reported that people living with HIV have greater chances of developing Kaposi Sarcoma, cervical cancer and non-Hodgkin lymphoma, while a high viral load of Hepatitis may also lead to liver cancer. The burden of cancer is increasing in Nigeria and there is a greater need to reduce the burden. I was very happy to attend this event and serve as a communications volunteer where I assisted to push advocacy messages on the negatives effect of Cancer. I met amazing people too and I also signed the 1 million signature to Beat Cancer. Project PINK BLUE is leading cancer-fighting non-governmental organization in Nigeria, last year, they won the prestigious World Cancer Day Spirit Award 2018 at World Cancer Congress in Kuala Lumpur, Malaysia for their World Cancer Day advocacy and collaborative spirit. All enquiries about the Abuja World Cancer Day Walk 2019 should be directed to info@projectpinkblue.org or call 08188347020. Please visit www.projectpinkblue.org to learn more.